Where is Wonder Woman at 70? Next month marks the 70th anniversary of the first appearance of Wonder Woman. She is one of DC comics Trinity, that is their best of the best, biggest, toughest and, in theory at least, most popular flagship characters. Like all comic book characters with such a long history, Diana has gone through many iterations over the decades and has been in the hands of dozens of writers, artists and editors. As well as comic books there have been animated versions, thousands of tonnes of merchandise, and of course the famous 1970s TV show starring Lynda Carter. There have been several attempts to develop a live action movie, but none have taken off. The most recent was going to be written and directed by Joss Whedon (who is currently directing The Avengers for Marvel) but sadly Whedon and those in charge couldn’t agree on the direction for the project so it was shelved. Earlier this year there was an attempt to develop a new Wonder Woman live action TV series. It was so badly received, and quite frankly utterly awful, that it was cancelled and mercifully never went beyond the pilot. One of the many reasons it was so poor is that those who developed the show didn’t understand the character. You don’t have to be a slave to the details but if you miss the heart of the character it will always die an early death. Over the years I’ve known several women who wear Wonder Woman clothing because of what it symbolises to them and they only knew about the character from the TV show. They’ve never picked up a Wonder Woman comic book and have no real interest in doing so. 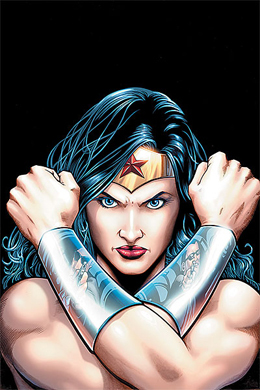 The Wonder Woman symbol is not quite as well known as Superman’s shield, which has become synonymous with hope and the tenets he upholds, but her symbol is a cultural icon. If you ask people what Batman stands for they will be able to tell you something about his endless war on crime and his thirst for vengeance. If you ask them about Superman they might cite the phrase ‘truth, justice and the American Way’. Ask the same person what Wonder Woman stands for and you’re likely to get one of several responses. Either it will be a blank stare, or you might get something about girl power, or more accurately something about a message of equal rights and equal opportunities for women. In the hands of a poor writer Wonder Woman becomes a blunt instrument with which they bludgeon readers over the head about issues in society. Topical issues should and can be part of a comic book story, where appropriate, but it should never be the entire story. It’s a comic book, not a political lecture on human rights violations. Equally those who make her into a cold hearted and brutal warrior, to make a point about her being able to stand toe-to-toe with male superheroes, to show that she is just as capable as them at beating up the bad guys, is doing the character an enormous disservice. She is an elite warrior but also a symbol for peace and love. She is a powerhouse who possesses great physical strength, but she’s also capable of great compassion and kindness. She is a leader and a battlefield general that was trained to fight, almost from birth, but she is also a warm and caring woman. Ignore any part of that and you end up with something hideous, hollow and probably callous. Wonder Woman might be the most popular female superhero in comics, but despite that, there is an imbalance. DC comics recently relaunched all of their ongoing monthly mainstream comics, which are predominantly superhero titles. 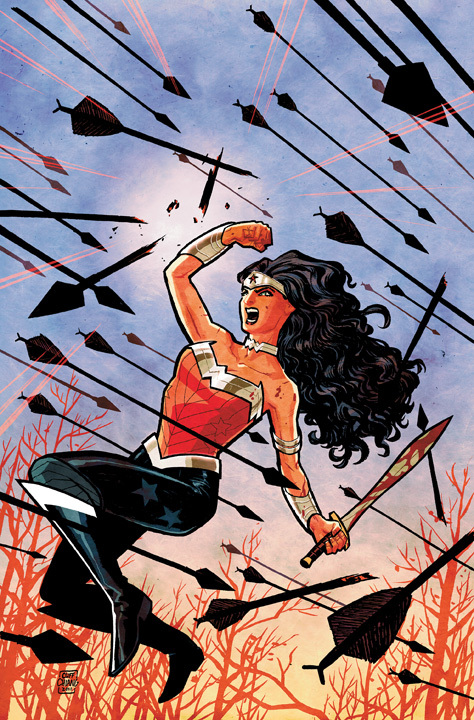 There is an ongoing monthly Wonder Woman title, but just the one. Taken from DC comics own ‘The New 52’ web page, there are 4 Superman related titles and 11 Batman related titles, but only one Wonder Woman ongoing monthly. To maintain full disclosure and to be fair to DC comics, I should point out that Wonder Woman is a member of the Justice League and will therefore feature in that comic, but so are Batman and Superman. Justice League is a team comic book and even though she will have some time in the spotlight, it will be shared with the other well known characters. Given all of that, I feel that there is a serious imbalance by only having one Wonder Woman title. If you look on DC comics website they have a list of 30 essential graphic novels. These are best-selling titles that are great places for newcomers to get a flavour for DC comics and also appropriate for older fans looking to expand their knowledge. Five of them are solo Batman titles, two are solo Superman, and four or five others feature both characters in a team up or Justice League scenario. Four of the team books feature Wonder Woman, but there again there are no solo books. I realise this is a slightly different point, as the list only contains best-sellers, but it does indicate an imbalance in public opinion as well. I believe some writers have captured Wonder Woman’s essence incredibly well and there are some great stories, but they just aren’t selling as well as other titles. The new ongoing Wonder Woman title is being written by Brian Azzarello and he has described it as a horror comic. That is to say, this is not a slasher comic with vampires or people being chased by a maniac in a hockey mask. To clarify, Azzarello has said in interviews it will be horrific only in terms of what the Greek gods get up to as they interact with the modern world. The gods are capricious beings that play with people, plot and scheme to their own ends, and to them people are objects to play with and do with as they wish. Peering across the street, I would guess that it is similar to what the Norse gods get up to in the Marvel universe where Loki is a dangerous and sneaky adversary who causes all sorts of problems. He was the main threat in the first Thor movie and is also the lead villain in The Avengers movie due out in 2012. This indicates those storylines can be interesting and broad enough that they appeal to a mainstream audience, so there is a thirst for this type of story if it is done well. In her own comic book Wonder Woman will be caught up in the middle of the games the Gods are playing and will have to deal with the fall out from their plots. She will be facing powerful beings that have the power and capacity to cause her serious harm, which will put her in genuine peril. So the Azzarello written comic book covers the mythological side of Wonder Woman, effectively dovetailing nicely into her origin and it involves her dealings with the gods. But for one of DC comics Trinity characters I think there should at least be a second ongoing monthly comic book which focuses on other more human and earthly aspects. For example a second title could look at how she is perceived by the general public. This aspect is being touched on in several DC titles including Action Comics (Superman as an alien outsider and an unknown quantity), Aquaman (a bit of a joke and misunderstood superhero), JLA (Batman as a myth) and so on. How does the average person on the street see Wonder Woman? What does she mean to them? There is also the fact that she is a powerful superhero in the twenty first century, a role model and an icon, in an era where fame and celebrities dominate the media. Also she doesn’t wear a mask, which makes it a bit more difficult to have a secret identity. I guess I’m more interested in the character and her role in today’s society than exploring her origin, which is being covered elsewhere. I’ve often looked at comic book characters and thought about which ones I would like to write and which I think could write. There are some that I would actively avoid, not because I dislike them, it’s more about not understanding or being able to relate to them. I like reading about Superman but at the moment I don’t have a single Superman story floating around in my head. Some characters are easy choices because I understand them, or I’m very similar to them on some level. But every now and then a character sneaks up on me and I find myself drawn to them. I never thought Wonder Woman would fit into that category but there she is. And now the ideas are rattling around my head. I sincerely hope DC comics does all it can to promote and improve Wonder Woman’s profile because I think she is a very interesting and special character that deserves more attention. Comments Off on Where is Wonder Woman at 70?